For their Picture of the Week last, uh, week, the Solar Dynamics Observatory crew chose a fantastically cool shot: the Moon cutting across the disk of the Sun! Wow! This phenomenal shot was taken on October 7, 2010, as the new Moon slipped between the Sun and the observatory. SDO is in Earth orbit, circling our planet 36,000 km (22,000 miles) up (technically, that's the distance from the Earth's center). The orbit is tilted so the Earth itself only rarely gets in the observatory's way as it watches the Sun day in and day out. This isn't to scale, but should help. You can see SDO and its tilted orbit (seen edge-on, so it looks like a line), allowing it to view the Sun without the Earth's big face getting in the way (from SDO's point of the view, the Earth is about 25° across, the apparent size of a dinner plate held at arm's length). 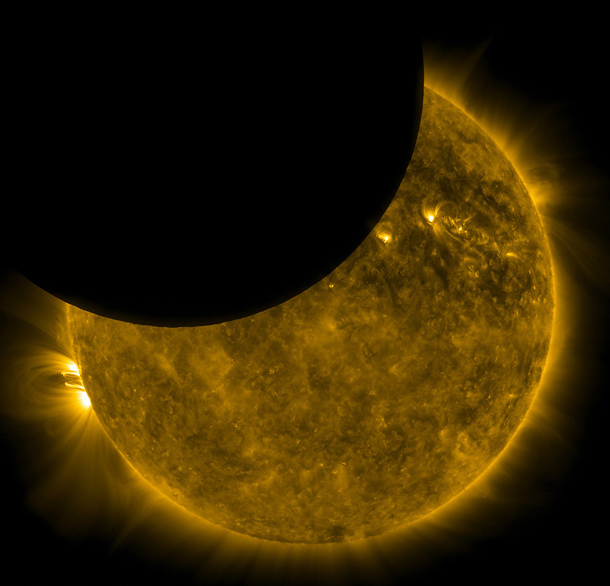 The Moon's orbit is tilted as well, and in this case, it happened to be in the way of SDO's line of sight to the Sun. The shot itself is amazing. It's false color: the camera was actually viewing the Sun in the far ultraviolet, where the solar magnetic field's churning turmoil can be seen plainly. You can see gigantic loops of hot plasma arcing up over the surface of the Sun and then plunging back down. On the left is a spectacular example of that... mind you, the Sun's disk is about 1.4 million km across -- 860,000 miles. That loop is well over 200,000 km (120,000 miles) high! The Earth would be a dot compared to that. When the Sun does something, it does it big. If you want to see more pictures like this, put the SDO Picture of the Week RSS feed into your reader. I already have, and when another amazing shot like this pops up, you can bet I'll write about it. Tip o' the X-ray specs to Lights in the Dark. - What does a lunar eclipse look like from the Moon?